Traditional Dakota/Lakota people firmly believe that the aboriginal North American horse did not become extinct after the last Ice Age, and that it was part of their pre-contact culture. Scientists know from fossil remains that the horse originated and evolved in North America, and that these small 12 to 13 hand horses or ponys (sic) migrated to Asia across the Bering Strait, then spread throughout Asia and finally reached Europe. The drawings in the French Laseaux caves, dating about 10,000 B.C., are a testimony to their long westward migration. Scientists contend, however, that the aboriginal horse became extinct in North America during what is (known) as the “Pleistocene kill,” in other words, that they disappeared at the same time as the mammoth, the ground sloth, and other Ice Age mammals. This has led anthropologists to assume that Plains Indians only acquired horses after Spaniards accidentally lost some horses in Mexico, in the beginning of the XVIth (16th) century, that these few head multiplied and eventually reached the prairies. Dakota/Lakota Elders as well as many other Indian nations contest this theory, and content that according to their oral history, the North American horse survived the Ice Age, and that they had developed a horse culture long before the arrival of Europeans, and, furthermore, that these same distinct ponys (sic) continued to thrive on the prairies until the latter part of the XIXth (19th) century, when the U.S. government ordered them rounded up and destroyed to prevent Indians from leaving the newly-created reservations. Although there is extensive evidence of this massive slaughter, no definitive evidence has yet been found to substantiate the Elders’ other claim, but there are a number of arguments in favour of the Indian position. Some biologists have pointed out that Elders could indeed be correct, for while the mammoth and other Pleistocene mammals died out during the last Ice Age in both continents, if the horse survived in Eurasia, there is no reason for it to have become extinct in North America, especially given similar environment and climate on the steppes and prairies. In Eurasia, scientists have been able to trace the domestication of the horse through extensive archaeological work, fossil remains, burials, middens (garbage heaps) and artifacts. Such finds have, for instance, enabled them to determine that peoples there ate horses, buried them with notables, and helped them establish that men started riding about 3,500 B.C. By comparison, very little archaeological work has been done on the prairies due in large part to budget constraints. There are also other problems. Whereas the Seythians, for instance, left magnificent gold jewelry which can be dated to 400 B.C., Indian petroglyphs are usually impossible to date accurately. Digs have also concentrated mainly on villages sites, but if prehistoric prairie Indians had the same aversions to eating horsemeat as Dakota/Lakota people have today, then middens (garbage heaps) would not contain the necessary evidence either. It is well known that Dakota/Lakota people have traditionally eaten dogs, and indeed they still do at certain times, but conversely they would no more eat horses than Europeans would eat dogs. So that if both these cultural traits, in regards to horses and dogs, are ancestral, it would be useless to seek horse remains in garbage heaps. Dakota/Lakota burial customs are well documented: Bodies were placed on scaffolds on the prairies, and the bones were collected, cleaned and buried about one year later. As there is no tradition of ceremonial horse burials, with or without humans, one can assume that horses were simply left to die on the prairies where wolves and other scavengers would have efficiently dealt with their carcasses, thereby leaving scientists, once again, with few, if any, remains to discover. So whereas the Eurasian cultural practices insured the survival of physical evidence of the presence and domestication of the horse thousands of years ago, it might well be that pre-contact Indian cultural practices and environmental factors are responsible for the absence of the same evidence on this continent. Dakota/Lakota people have an extensive “horse vocabulary,” and they distinguish between their “own” horses, which among other names they call “sunkdudan,” the small-legged horse, and the European imported horse which they call the long-legged horse, or the American Horse. Between 1984 and 1987, this writer conducted extensive research on the prairies to retrace the itinerary of Louis-Joseph LaVerendrie who left a village site near Bismark, North Dakota, on 23 July, 1642, in an attempt to find the “People of the Horse.” He hoped they would take him to the “Western (China) Sea,” which Europeans had long sought in North America. He traveled 20 days, guided by two Mandans, and on 11 August (1642), he reached the “Mountain of the People of the Horse” where he waited 5 weeks for their arrival. In trying to locate this campsite, this writer used LaVerendrie’ s maps and diaries, as well as other documentation and interviewed numerous Elders and old ranchers. Eventually the site was located in Wyoming, and all of the people he met and traveled with were found to be Lakotas. But these interviews also lead to a wealth of information about the Indian pony. According to Elders, the aboriginal pony had the following characteristics: It was small, about 13 hands, it had a “strait” back necessitating a different saddle from that used on European horses, wider nostrils, larger lungs so that its endurance was proverbial. One breed had a long mane, and shaggy (curly) hair, while another had a “singed mane.” This writer contacted a specialist in mammals and was told the Elders were describing the Tarpan and the Polish Przewalski horses, and that early, independent eyewitness accounts ought to be investigated to confirm the Dakota statements. This lead to further research for creditable European reports. “I interrupt my discourse, to say a few words concerning the horses of the Indians…At a cursory glance one might mistake them for horses from the steppes of eastern Europe. The long manes, long necks, strong bodies and strait back make them appear like the horses of Poland…On the whole the horses of the Indians are very enduring…” (So. Dak. Hist. Soc., XIX:378). If Elders are correct, and if the aboriginal pony did survive, it might well also explain why the ponies so closely resembled the Tarpan or the Polish horses, and perhaps systematic extermination of these ponies by the U.S. government has deprived science of very valuable information. Other evidence exists which also militates in favor of the Indian position, that the aboriginal horse had already been tamed and ridden at the time of (white) contact. From this description, it became evident that the “unicorns” seen by the Iroquois, in his younger days, were simply horses whose riders, perhaps hunting buffalo at a gallop, held their long spears in front of them, between the horse’s ears. As for the “cloven hoofs,” these could well have been the seams of the hide horseshoes Indians sometimes used. “Those people have their haires long. They reape twice a yeare; they were called Tatanka, that is to say buff (buffalo).” Tatanka is of course the Dakota/Lakota name of the buffalo, and as Radisson states, it was — and still is — the sacred name of the entire “Sioux” nation: Tatanka Oyate, or Pte Oyate, The Buffalo Nation. This passage is interesting because it contains the very first Dakota word ever written by a European, and at the same time gives the true name of the nation, mistakenly called “Sioux” by later Europeans. “The Indians are extremely bold and daring riders. This is shown especially in their hunting of the buffalo. In this dangerous work it is often hard to say which has the greater skill, the rider or the horse. Since the Indian who manipulates the bow and arrow can not make use of the reins, he must leave the horse entirely to its own discretion. The animal must be carefully trained to approach the bison within a few paces. It must run close to the powerful and often angry bull, and must be ready at all times to evade with the greatest swiftness the charges of the terrible oppoinent.” (S. Dak. Hist. Soc., XIX:379). The interesting point here is that several years prior to 1657, these Prairie Indians were already expert horsemen, having developed remarquable riding and hunting skills. That such expertise was developed by 1650 is remarquable in many ways: It implies that the original 11 head had so multiplied that within a few short years after the horses appeared, these Prairies Dakotas had devised methods for catching them, had learned to tame them, had become expert riders, had devised the most efficient buffalo hunting techniques on horseback, and had also devised techniques for training their horses in these skills. These accomplishments, in so short a time, seem all the more extraordinary when examining the development of similar skills in other areas of the world. “Perhaps most important, the untamed horse is naturally likely to go all but beserk when anything lands on its back, simply because it has learned through the millennia that anything is likely to be a predator. Thus, if man had dreamed of riding the horse much earlier than he did, he could hardly have expected a hospitable reception from the animal that one day would become his partner.” (Trippet, 1974:47). Thus Trippet explains why inhabitants of the steppes only began riding about 3,500 B.C., thousands of years after they first appeared on that continent. The same reasons, however, would seem to preclude Prairie Dakotas from being so bold and so skillful, so quickly, not to mention adopting an entirely new horse culture in an exceedingly short time. Yet, another point is even more interesting. It has been argued that Indians had seen Spanish riders, and thus had developed their astonishing equestrian skills, but an example from the Middle East, where a similar situation occurred, shows the time required from the arrival of this “strange beast” into culture, to when its people rode awkwardly for several generations after it first appeared among them, even when experts were there to teach them. These examples from other cultures make it difficult to believe that the aboriginal horse had indeed disappeared during the last Ice Age. First, the initial 11 head herd, released in the early XVIth (16th) century, would have had to multiply rapidly in a few years, and to such an extent that horses in sufficient numbers reached the prairies. Then, between that time and at the latest 1650, Dakota/Lakota people would have had to overcome their “mercurial disposition. ” Prince Frederick mentions repeatedly how wild these ponys (sic) were. Then, they would have had to learn to catch horses, tame them, learn to ride, become expert horsemen, devise the best techniques for training their horses in these skills. Compared to the time required by the Assyrians — with expert teachers — and indeed all other Eurasian horse cultures, to develop such accomplishments, the Indian feat seems unbelievable. Trippet (1974:47-48) concluded that: “In light of the horse’s mercurial disposition, its eventual conquest by man seems in many ways a fantastic achievement. ” Even more fantastic, then, is the incredible speed with which a horse culture was developed by the Dakota people. It might, however, be explained if the aboriginal North America horse had survived the Pleistocene, and thus had been part of a long-standing horse culture before the arrival of Europeans, as Dakota/Lakota Elders contend. And, therefore, that they had acquired these skills over the millennia, like their Eurasian counterparts, rather than in the space of one or two generations. Although there as yet (is) no conclusive physical evidence that the aboriginal horse survived the Pleistocene, and was part of the pre-contact civilization on the prairies, there is sufficient evidence — and indeed much more than is presented in this short paper — for experts to seriously reconsider that long-held theory that Prairies Dakotas had to wait for the arrival of the white man to give them horses. According to the Dakota/Lakota oral tradition, the aboriginal horse never became extinct and was part of their pre-contact culture. The horse is aboriginal to North America, and biologists can offer no scientific reasons for its extinction here and not in Eurasia. The absence of post-glacial remains could well be explained by Indian/Dakota cultural traits and environmental factors. The astounding horsemanship of Prairie Dakotas within a few years of the appearance of the “Spanish horse,” argues for this having been a traditional skill. The government pony-extermination policy may well have deprived scientists of unique specimens. Many theories have taken root because of preconceptions and bias. In this instance, no one can deny a long-standing prejudice against Indians, and the efforts which were made to minimize their accomplishments in many areas, and to discount oral history. In light of the above, one might well wonder if the long-held theory regarding the Indian pony is not a survival of these XIXth (19th) century prejudices. Definite proof of the survival of the aboriginal North American horse, and of a pre-contact Indian horse culture, might yet be discovered. Whatever happens, the few remaining Indian ponies should be treasured as part of North Dakota’s unique heritage. Horses definitely originated here, and whether the few remaining ponys (sic) are throwbacks, or are they actual descendants, they are a living testimony of the state’s contribution to the advancement of many civilizations throughout the world. PRESENTED BY Claire Henderson, Laval University, Quebec, Canada. 2-1-91. Every horse in the world can be traced to a single mare that trotted the earth about 130,000 to 160,000 years ago, scientists discovered for the first time. The research identified 18 different genetic clusters that arose from the ancestral mare, suggesting that domestication occurred in many places across Europe and Asia, according to work published today in the Proceedings of the National Academy of Sciences. The study helps pinpoint the time when humans began domesticating horses, though it was known to be after dogs, sheep, pigs and cattle. The research may also help scientists classify horse fossils, figure out the pedigree of modern breeds and perhaps evaluate how genetics affect racehorse performance, said Samantha Brooks, an assistant professor of equine genetics at Cornell University, in a telephone interview. Horses and chariots were used as weapons until the 20th century, when machine guns, tanks and airplanes were developed. They were used to clear forests, plow land and herd cattle. Until the 1800s, the fastest way to travel over land was on horseback. The study, led by Alessandro Achilli, a researcher in the department of cellular and environmental biology at the Universita di Perugia inItaly, analyzed mitochondrial DNA, which contains genes that are essential for the cell’s energy functions. These genes are inherited solely from the mother. Horses lived throughout Europe and Asia during the Paleolithic period, although many lineages probably didn’t survive the peak of the last glacial period, from 26,500 to 20,000 years ago and another later period that covered Europe in ice. There were probably horse refuges in the Ukraine, Turkestan and the Iberian Peninsula, because those places were less cold. The 18 genetic clusters suggest that horses were domesticated multiple times, in different places. At least one horse domestication happened in Western Europe, possibly in the Iberian Peninsula, the authors wrote. The study was conducted using 83 genomes from horses across Asia, Europe, the Middle East and the Americas. To contact the editor responsible for this story: Reg Gale atrgale5@bloomberg.net. Fact: North America is the literal birthplace of the wild horse. The magic of the horse originated on this land, then culminated globally and marked a turning point in the history of mankind. No other animal has had such influence and impact on humankind’s development. To the wild horse, to the tamed horse, we owe immense gratitude and respect, for the horse gave two-leggeds a massive advantage and was instrumental in our development and our survival. Humankind will forever owe a great debt to the horse. In our evolution it is historic fact that wild horses originated and fully developed on the North American continent. It is fortunate for man that some of those wild horses drifted across the Bering Land Bridge to Eurasia, because those remaining on the northern continent were subject to a big die-off 10,000 years ago; as is the case for many species throughout time for various reasons. While many, many moons ago there existed a contiguous land mass which could be walked, the melting of the ice age gave way to rising waters which eventually divided continents by surrounding major land masses with oceans. This of course isolated pockets of humanity and life forms, including horses, until two-legged travel by water evolved. Recorded history tells us that around 4000 BC man’s interactive relation with the horse was put in motion. Eurasians learned to tame and work with descendants of horses that had traveled by land from their birth place in North America. This unleashed endless possibilities and ultimately led to the building of societies and empires. With the horse came power, strength, travel and speed.It was not until Columbus crossed the Atlantic on his second voyage to North America that he brought horses along with his many men to the shores of this continent. This game changer marked the horses literal return home. This was the first time since the big die-off on the northern continent that the horse was finally back on its home turf – a monumental event which required a boat for transport. READ MORE HISTORY: THE HAGERMAN HORSE OF IDAHO – The Hagerman Horse (Equus simplicidens) was a North American species of equid from the Pliocene period and the Pleistocene period, first appearing about 3.5 million years ago and the Hagerman fossils represent the oldestwidely-accepted remains of the genus Equus. An average Hagerman Horse was about the same size as an ArabianHorse and probably lived in grasslands and floodplains, which is what Hagerman was like 3 million years ago. Native North American horses went extinct about 10,000 years ago, at the same time as many other large-bodied species of the period. It is one of the oldest horses of the genus Equus and is the recognized State Fossil of Idaho.Cattle rancher, Elmer Cook, discovered fossil bones on this land in Hagerman, Idaho in 1928 and showed them to Dr. H.T. Stearns of the U.S. Geological Survey, who in turn passed them to Dr. James W. Gidley at the Smithsonian Institution. The bones were identified as belonging to an extinct horse, hence the site became known as the Hagerman Horse Quarry. Three tons of excavated specimens were sent to the Smithsonian in Washington, D.C., producing five nearly complete skeletons, more than 100 skulls, and forty-eight lower jaws along with numerous isolated bones. Paleontologists believe that an entire herd of these animals were probably swept away and drowned by flood waters, ending up buried and fossilized in the soft sands of this river bottom. Photo © Ellen Holcomb, all rights reserved. Fact Checker: Mustangs – return of the native or invasive species? 1) Wild horses didn’t become extinct in North America and remnants of the ancient herds were still present in this hemisphere when Columbus landed in the New World in 1492. 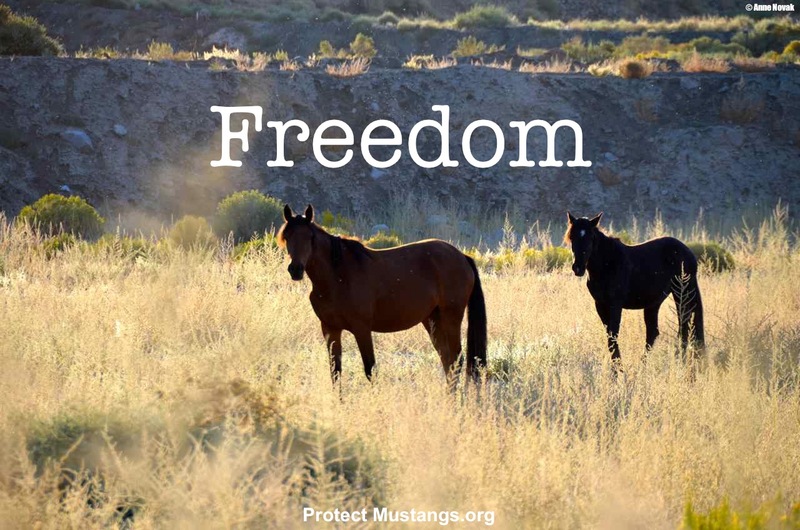 2) Mustangs on public lands are a feral, invasive species, introduced into an environment where they are not native and should not be allowed to roam. The two claims are at opposite extremes of an ongoing debate that surrounds the federal government’s wild horse roundups in the West. It’s generally accepted that horse species evolved on the North American continent. The fossil record for equine-like species goes back nearly 4 million years. Modern horses evolved in North America about 1.7 million years ago, according to researchers at Uppsala University, who studied equine DNA. Scientists say North American horses died out between 13,000 and 10,000 years ago, at the end of the Pleistocene Epoch, after the species had spread to Asia, Europe, and Africa. Horses were reintroduced by the Spanish explorers in the 16th century. Animals that subsequently escaped or were let loose from human captivity are the ancestors of the wild herds that roam public lands today. That’s the theory, but revisionists point out that some sources, including the Book of Mormon and Native American cultural tradition, say horses have been continually present on the continent long after the last Ice Age. Some folks contend the original Appaloosa horses of the Nez Perce tribe, which were distinct from other horses, were a remnant of the original equines of the Americas. Over the years, the horse extinction theory has changed. Many scientists once thought horses died out on the continent before the arrival of the ancestors of the American Indians, but archeologists have found equine and human bones together at sites dating back to more than 10,000 years ago. The horse bones had butchering marks, indicating the animals were eaten by people, according to “Horses and Humans: The Evolution of Human-Equine Relationships,” edited by Sandra L. Olsen. So it appears that humans and horses coexisted in the New World prior to 1492, but did they continue to survive in North America over the last 100 centuries? The claim that wild horses in America are as invasive as Asian clams in Lake Tahoe or rabbits in Australia also is made in the wild horse management debate. Some ranchers call mustangs “long-legged rats” and reader comments on RGJ stories about roundups always include opinions that the mustangs are feral interlopers and should be dealt with as vermin. Federal law makes the argument academic. Federal officials are charged with managing the free-roaming herds to achieve an ecological balance, and disagreements about the wisdom and quality of that management is the source of current debates. By definition, horses are North American natives because most of their evolutionary development took place on this continent. They are “native” rather than “livestock-gone-loose,” because they originated here and co-evolved with the American habitat, according to Jay F. Kirkpatrick, director of the Science and Conservation Center in Billings, Mont. DNA research by molecular biologist Ann Forsten of Uppsala University concludes the ancient horses and the modern domestic horses are the same species. That finding contradicts critics who maintain the original North American horses and the ones that were reintroduced aren’t the same animals. No one is certain why, at the end of the last Ice Age, equines vanished from the hemisphere. Theories of the cause of the extinction include drought, disease, or a result of hunting by humans. The submergence of the Bering land bridge prevented any return migration from Asia. There’s no proof any horses escaped extinction in the Americas. If horses survived in the New World up to the 15th century, then no one has ever been able to find the physical evidence to prove the theory. The horses were “reintroduced” to the continent, unlike the Asian clams in Tahoe or the rabbits of Australia, which were inserted into regions where Nature never put them and where they could disrupt the ecological balance. Truth Meter: 1 Given what we know about the history and evolution of horses in North America, both claims are false. Has this information been given to the BLM ?? Has this information been given to the govt. agencies that NEED to have it ??? Dose this mean that the wild horses would be better protected ?? I have so many questions. Yes the BLM and other agencies have been notified but . . .
Michelle, this is a perfect example of why a Federal Judge called the BLM ‘Studiously Ignorant”. They choose to stick their head in the sand and play dumb. I guess they don’t play dumb because they are. They have chosen not to learn or at least admit they’ve learned and that THEY are the GREAT AND OMNIPOTENT OZ. The one who knows all. In fact they’ve just gotten lost in the poppy fields. As is such with the BLM and the ” Great Debate ” otherwise known as “Are they or aren´t they” If you repeat you´re own BS enough times, each time you say it, it sounds better and depending on your intelligence level… soon enough, you´re believing it. Come you guys, why are you trying to discredit someone who has hard facts to back them up. Dr. Ross MacPhee is an EDUCATED man and knows where to get his facts…not from some local BAR… remember these animals can feel a fly land on them. Why do you insist on the abuse??? Excellent sources and disproves all the prejudiced claims of the wild horse enemies! They belong here and they deserve to live free! This is a very interesting and informative article and the history of our Wild Mustangs and the Aboriginal Native Americans in North America. I agree with this finding – that the Lakota/Dakota tribes people had these horses for use since the beginning of the time they said. And even if some Mustangs did come on up from Mexico, it still doesn’t mean that they are not American horses by now. The BLM is over-stepping their powers and authority to continually harass our wild Mustangs with these round-ups. Our Native horses need to live free, roam free, and live a stress-free life, not being continually harassed by the BLM. We need to respect and protect them. They are majestic, sensitive animals that SHOULD NOT BE ALLOWED TO BE DRIVEN OFF OF THEIR LAND. This is a disgrace. This is a disgrace by the BLM. 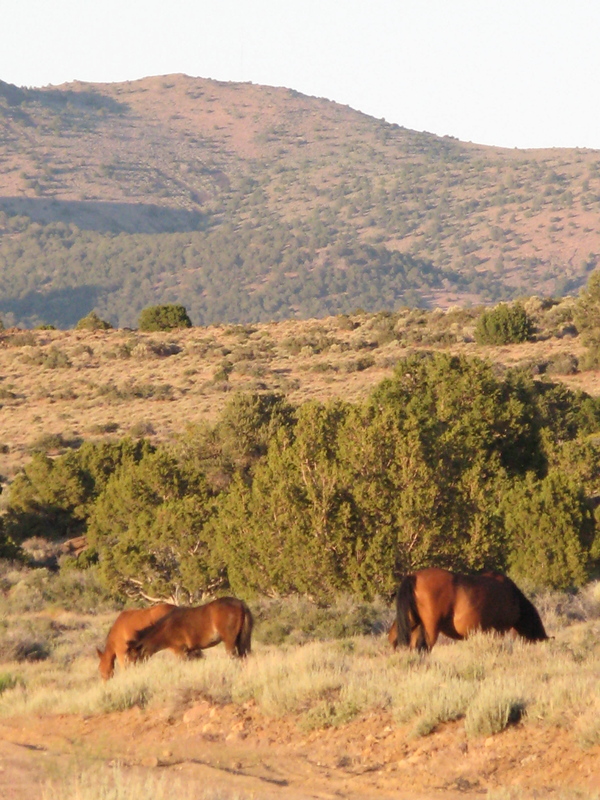 These Wild Mustangs have AN INHERENT RIGHT to be here, to live free, and THRIVE in the wild. We MUST STOP the BLM right now with their tactics. Not only do our Native American Tribes need these horses, but the rest of us Americans need these wild horses too. They are OUR HORSES, and we should HAVE A SAY in what happens to these magnificent animals. They are very necessary to our culture and heritage that needs to be respected. They have a RIGHT to live free and thrive, on our lands. 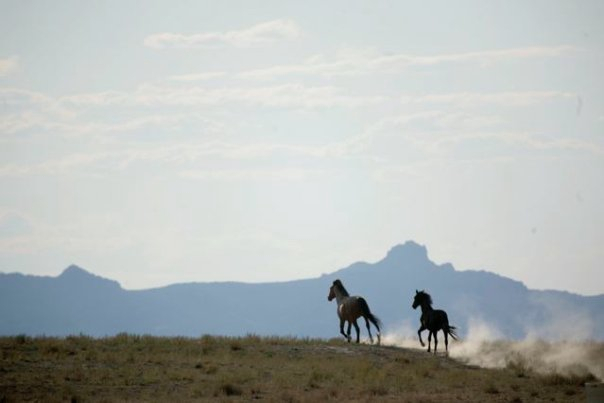 We DON’T want to see barren land out west – we want to see beautiful horse herds roaming with their family groups. Why did the last truth meter say both claims are false? This belies Mullen’s whole preceding train of thought. Board of Livestock. Management. Yesterday. They turned into the Board of Veterinary Medicine. I said that I was staking a CLAIM on Pumpkin And Gaia. I spoke to Barbara. No last name. She said that she would give a Msg to Ray or Ray. And he would Call Me Back. Waitsd at least 2 HOURS. I finally Called them Back. This time I spoke to Becky. She did give me her Last Name. She said that she would give the Msg. To Rae or Ray can’t remember his last name. ? Diaz. Or some other guy. Mr. Butts or Butz. Who knows what. I said that I would Rather speak with Mr. Diaz or Ray. And that Pumpkins new name will be Rose Lee. Sorry I already Named them. They rr my future horses and I want an answer Soon. Not Later. I will have to follow Up on this. Because I don’t know if they are the NMVMB. Or the NM Live Stock Board.